The third GOP debate has officially wrapped up. Yet again, two events were held: a JV debate featuring four candidates polling at 3 percent or lower, and a prime-time debate featuring the top 10 hopefuls. Just two GOP candidates have dropped out since the first debate was held in August, leaving many viewers wondering if any more cessations are to come. 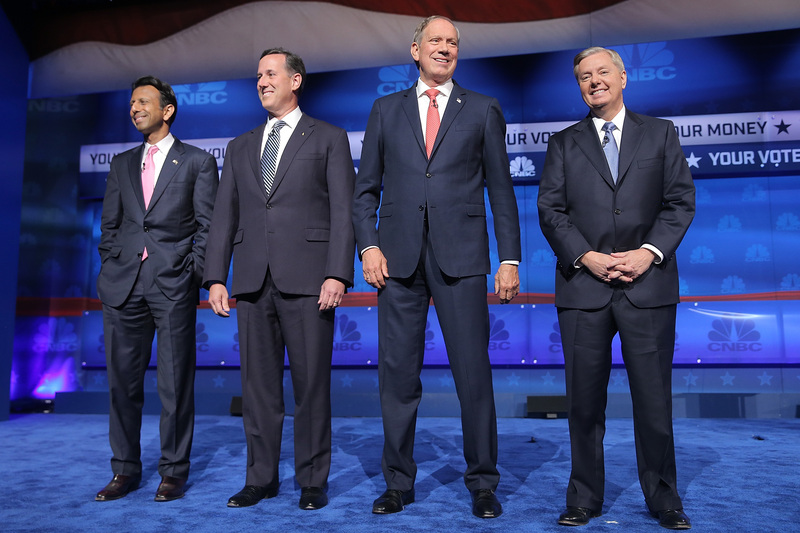 Who will drop out of the Republican race next? The CNBC-hosted debate, held at the Coors Event Center at the University of Colorado in Boulder, featured a whole lot of surprises and shakeups. Donald Trump was uncharacteristically quiet, and when he did speak, he offered up evasive rhetoric, and even said he was looking to leave as soon as possible. Many candidates, most notably Ted Cruz, bashed the CNBC moderators, as well as the mainstream media as a whole. It's difficult to say how such tactics will count against Trump, or whether Cruz's fiery speech against journalism will earn him extra support. There were quite a few moments when JV debaters appeared more than ready to enter the primary debate. During their forum, Louisiana Gov. Bobby Jindal appeared impressively focused, touching on issues of shrinking the government and balancing the federal budget. Anything can happen between now and the next debate, to be held Nov. 10 at the Milwaukee Theater. But here are the candidates who may not make it there. Former Virginia Gov. Jim Gilmore once again was forced to miss both debates due to the fact that his low polling numbers left him ineligible. All a candidate had to do was receive at least 1 percent on any CNBC-approved poll to make it to the JV debate, yet Gilmore couldn't garner enough support. It feels only inevitable that Gilmore would call it quits after missing two debates in a row. It appears that once again, former South Carolina Sen. Lindsey Graham has won the pre-debate forum. His performance at the Coors Event Center even earned him support from 2012 GOP presidential nominee Mitt Romney, who praised Graham's speech on foreign policy. Despite the clear momentum, Graham's poll numbers have continued to decline. He really has no incentive to continue if his stellar performances are only netting him slumping popularity. Despite consistently making the primary debates, Kentucky Sen. Rand Paul continues to stay on the flanks of the stage. He has only continued to alienate his fellow candidates and cast doubt as to whether he'd make a viable candidate. Paul's performance at the third debate yielded many cringe-worthy quotes, and did little to advance a candidate who keeps getting asked whether or not he's still running for president. Even The Washington Post has questioned why Paul hasn't dropped out of the race despite showing zero forward momentum. The hopeful may finally bow out after yet another disastrous debate performance.